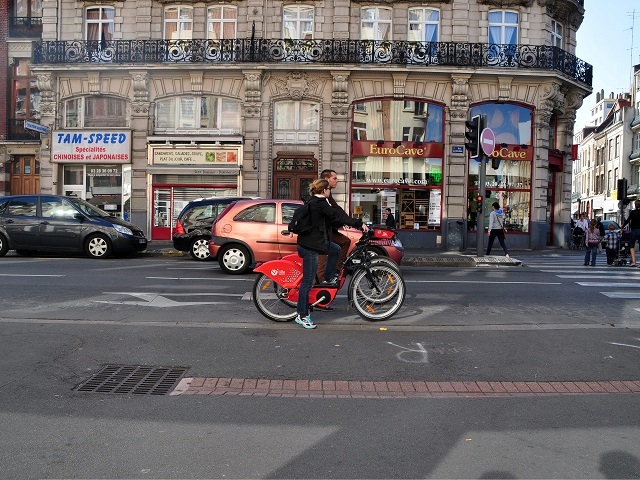 By aligning local and national policies and coordinating between sectors, Lille, France was able reduce transport emissions and save money. Photo by mi chiel/Flickr. While cities need to address energy and climate challenges, national governments can play a critical role in enabling local action. As ministers from 23 countries highlighted at the Clean Energy Ministerial in Merida, Mexico last May, national governments can provide support by coordinating and integrating urban development policies. What does this look like on the ground? Take the example of Lille, France. In 1994, Lille began developing a program to convert organic waste into energy. Over 20 years later, the city now has a fleet of over 400 buses that run on biogas, using the compost byproduct as fertilizer on large farms in the surrounding peri-urban area. Lille’s story illustrates how coordinating between the energy sector and other sectors allowed the city to make its urban energy system more sustainable. By understanding how various sectors interact and integrating policies between local and national levels, cities can identify opportunities for sustainable urban development while achieving energy and climate national goals such as Intended Nationally Determined Contributions (INDC). Lille’s success came through a series of incremental steps. First came infrastructure for delivering natural gas to the transport sector. This included a distribution terminal, refueling stations, and a pilot test using biogas. This was followed by an increase of buses powered by natural gas from 8 in 1998, to 127 by 2004, and finally over 400 as of today—95 percent of the city’s entire fleet. In 2007 an Organic Recovery Centre opened with the help of a reduced loan from the European Investment Bank for 50 percent of the total amount, as well as €3.8M in external funds and grants from a variety of regional and national agencies. The center not only diverts solid waste that will otherwise end up in landfills, but it also harnesses enough biogas to power over 100 buses, and replaces 7,600 MT of CO2 from fossil fuels with renewable biogas. Because city authorities demonstrated that they were comfortable with experimenting, this long term and incremental approach helped manage political and financial risk. Additionally, by gradually implementing the program, the city could carefully coordinate between sectors and ensure sustained capacity-building. The program’s success is a product of both vertical integration—between local and national policies—and horizontal integration—between local sectors. A national policy placed biogas under the same fiscal scheme as natural gas, allowing the city to receive a tax credit for using biogas for public transport. Similarly, at the international level, the European emissions trading program provided additional financial incentives. At the local level, the Urban Community Council of Lille, the Municipal Waste Division, and the Research & Development Department worked together to coordinate the solid waste sector with the transport sector. This included implementing a household organic waste collection program, making funds available for research and testing, and facilitating the permitting processes for building infrastructure and circulating vehicles. Lille shows why vertical and horizontal alignment are critical for actionable change. Local governments need to recognize potential synergies between sectors. Doing so can enable them to implement the incentives and policy instruments needed to form multi-sectoral programs that can achieve clean energy and air quality goals without crippling the city’s transport system and economic growth. Similarly, national governments are recognizing the important role of cities in achieving national climate and energy goals, since it is cities that ultimately implement solutions on the ground. Policy coordination and alignment are critical for ensuring the success of local initiatives that involve developing infrastructure, implementing technologies, and building capacity. Vertical integration not only allows cities to navigate potential regulatory barriers, but also helps create a level playing field for biogas to compete with other fuels that have already been receiving tax incentives or subsidies. Local and national policies need to progress together—through agenda setting, policy formulation, implementation, evaluation, and replication. As cities become more aware of the challenges of climate change and energy security, local leaders are becoming increasingly interested in reducing energy consumption as well as GHG emissions. Vertical and horizontal integration of policy has been successfully replicated in places such as Stockholm, Graz, Prague, Bern, and Pécs, where producing biogas from waste has helped local governments address specific energy needs. The case of Lille shows that cross-coordination and horizontal integration among various urban services sectors—wastewater utility, public transportation, solid waste collection and handling—is possible and brings a range of benefits.